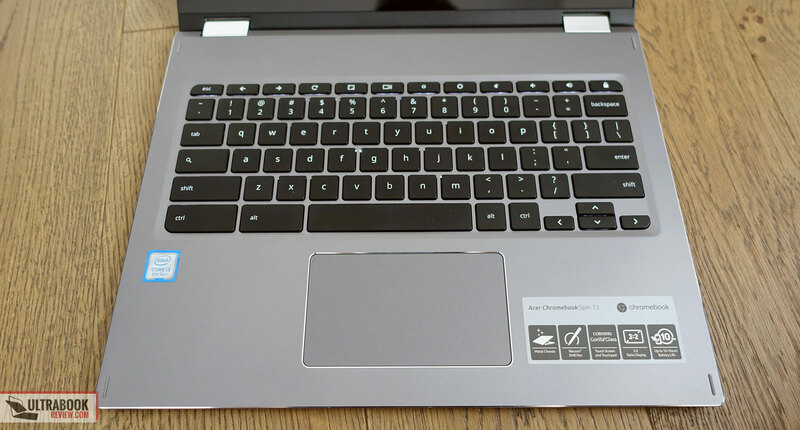 Summary: The Chromebook Spin 13 checks most, if not all the right boxes. It's well built, it looks nice, it gets a good 3:2 screen with an included EMR pen, punchy speakers and a fast keyboard. It's also more powerful than most other Chromebooks on the market and still lasts for a fair while on each charge. However... this is also large, heavy and expensive for what it is, thus primarily an option for potential power-users who require the increased performance and plan to take good use of its future Linux app support, which is still a work-in-progress for the time being. 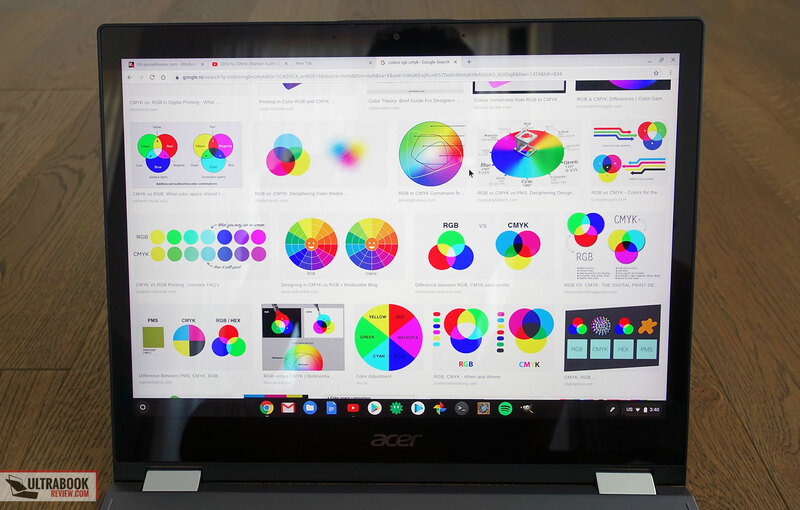 We don’t often review Chromebooks here, but I’ve spent time with a handful of them over the years and witnessed how their functionality has evolved. 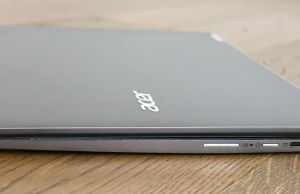 This article is about one of the premium-tier Chromebooks of the moment, and also one of the fastest: the Acer ChromeBook Spin 13. I’ve used it for the last three weeks and gathered my impressions below, with the strong points and the quirks. 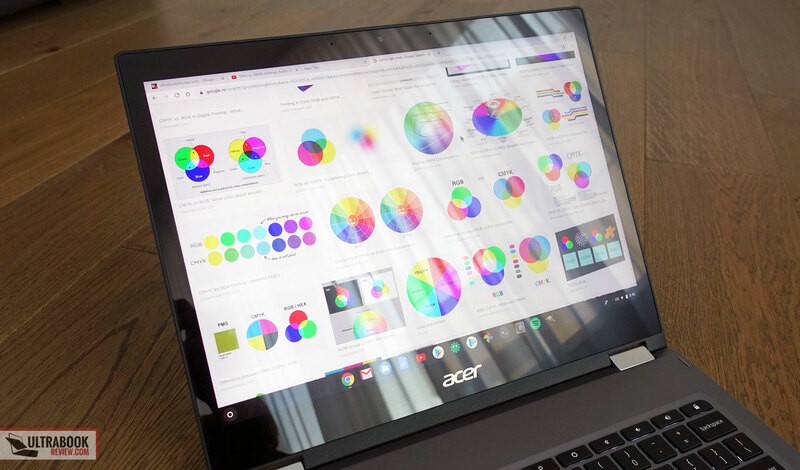 We’re not going to focus on what Chromebooks are, what they can and cannot do, I’d reckon you’re already familiar with the topic if you’re interested in this product, but you can head over to this article if you’re not. 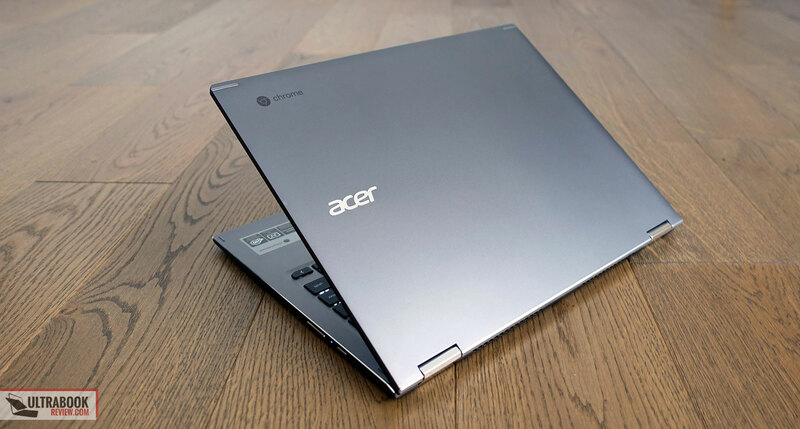 My article looks at the Spin 13 Chromebook from a Windows user’s standpoint. 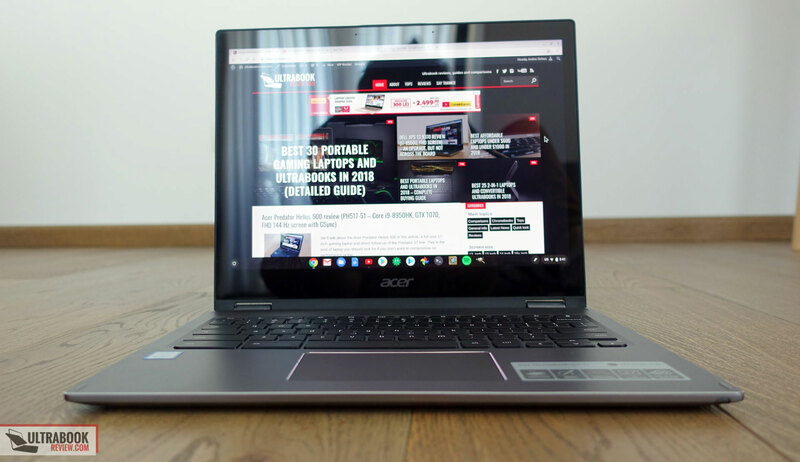 I never truly adopted a Chromebook as my portable companion, but after spending the time with this one, I can see why a top-tier 2018 Chromebook could be the right pick for the average user that needs a well made, snappy and easy to use computer for everyday activities like browsing, video, email and so on. 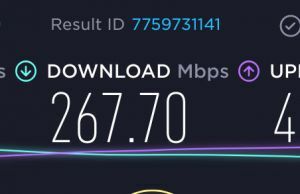 The experience is still limited in some ways, and should be improved in the near future in some other ways, but there’s definitely good value in this product. As a disclaimer, out test unit was a loaner from Acer and was returned after the article was published. 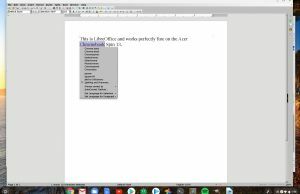 It’s an early production version, thus some aspects might change in the months to come, with OS updates and improved software compatibility. We’ll talk about all these in the article. 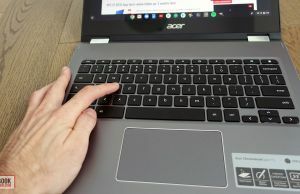 Acer offers the Chromebook Spin 13 in several different configurations, with either an 8th gen KabyLake-R Core i3 or i5 processor, 8 or 16 GB of RAM, as well as 32 to 128 GB of storage space. Our configuration is the value buy, the better balance between performance and price. 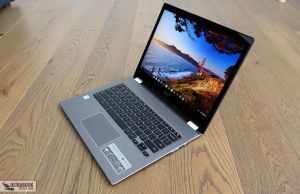 The Chromebook Spin 13 looks nice, is made entirely out of metal and feels sturdy in hand, with a dark ash color scheme and a few crude-aluminum beveled edges around the interior and touchpad. 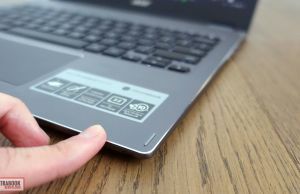 There’s a little bit of flex in the lid and in the keyboard deck, but you’ll barely even notice it in real life use, as it has absolutely no effect on the screen or the typing experience. 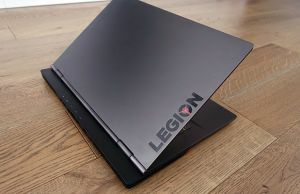 However, while I like the aesthetics and the build quality, I can’t look past the fact that this is huge in comparison to some of the 13-inch Windows notebooks out there, and even compared to the Pixelbook (12.1 x 9.7 x .66 inches vs 11.4 x 8.7 x .4 inches). 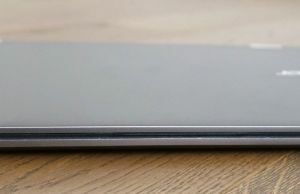 It’s also thicker and fairly heavy at about 3.2 lbs according to our scales (vs 2.4 lbs for the Pixelbook), but the weight is at least partially justified by the big battery inside. Regardless, I haven’t seen this kind of bezels for a while, and the sensation is amplified by the 3:2 screen ratio. People have been complaining about the bezels on the Pixelbook, and Acer actually went with thicker ones on this Spin, one year later. Before you jump on me for comparing the Spin to the Pixelbook, yes, I’m perfectly aware that’s a more expensive product with a smaller battery and different kind of hardware. 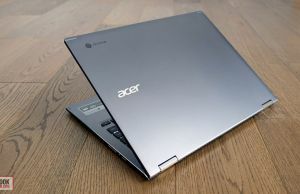 But I still believe Acer could and should have made this Spin a little smaller. That apart though, the Spin 13 is fairly practical. The screen is hold in place by two sturdy hinges, which allow to lift it up with a single hand, but you’ll still need both hands to push it past 90 degrees. 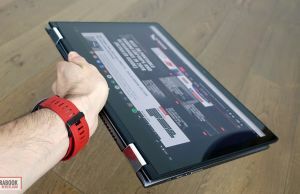 This computer is a convertible, and the screen goes back to 360-degrees, so you can use it as a regular notebook, but also as a tablet or in stand/tent modes. It’s mostly been a laptop for me, sitting on the desk or in my lap, and I’d reckon it’s going to be the same for most of you. We’ll have to get back to the PixelBook when talking about the tablet experience, as the Spin 13 falls behind once more. 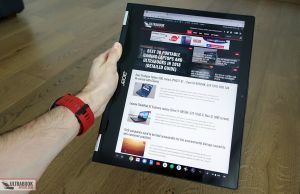 The overall design doesn’t allow the screen part to sit flushly on top of the main body while in tablet mode, and there are no magnets to keep the two halves together in this case, thus the device is a bit difficult to hold and use. On top of that, the Spin 13 is also chunky and heavy for a tablet, one more reason why this is primarily meant to be used as a laptop. I do have one gripe with the notebook mode as well: the sharp edges around the interior. 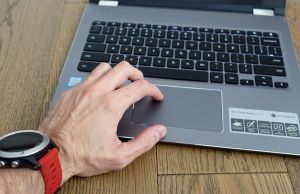 The palm-rest is spacious and offers good arm support, but your wrists are going to lean on these edges if you’ll use this on a cramped desk, and they won’t like it a bit. 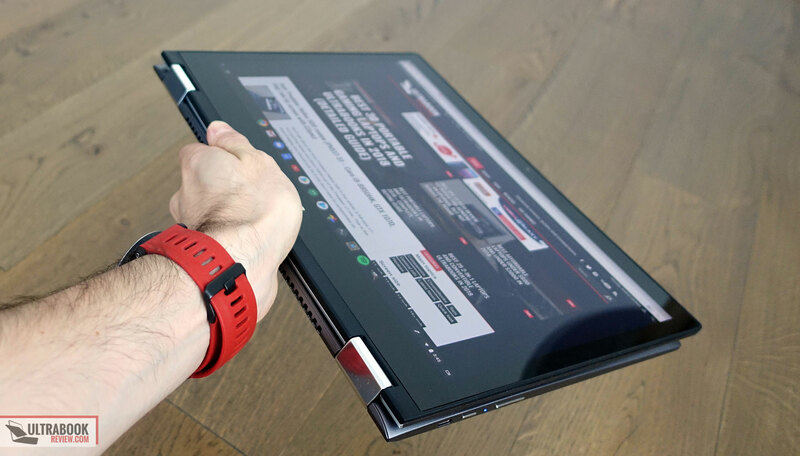 That aside though, the Spin is a great laptop and sits firmly anchored on the desk, thanks to the grippy feet on the bottom. The IO is rather limited, with two USB-C ports, a microSD card reader and a full-size USB-A port. There’s no HDMI, so you’ll need an USB-C to HDMI adapter to push video to a larger screen. 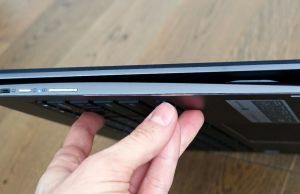 I would have also preferred a full-size card slot, but I understand that one that could have entirely fit an SD card would have taken too much space. 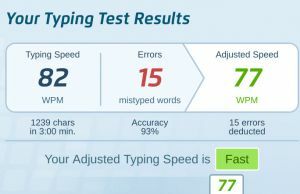 This laptop is one of the most well-balanced typers I’ve got my hands on in a while. The keys are well sized, feel nice to the touch and don’t travel very much inside the frame, just like I prefer. 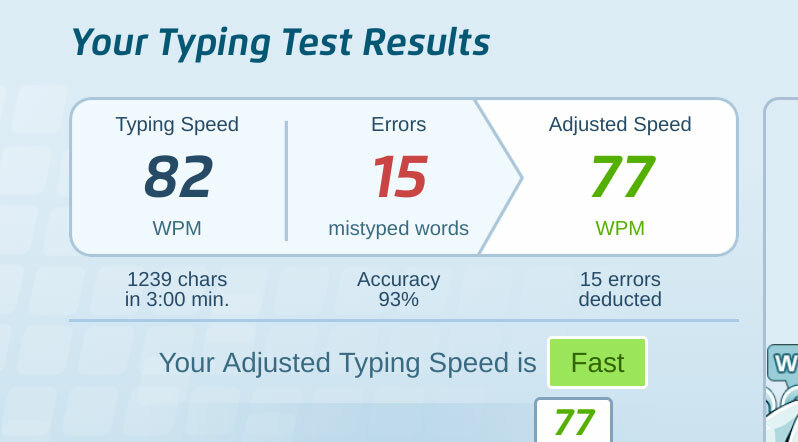 However, their response is a little soft and the actuation lacks a very precise click, so while I was able to type quicker than on most other keyboards, it took me a while to get the accuracy in check. This keyboard is also backlit, and you can adjust the illumination level by hitting Alt + the Brightness keys. 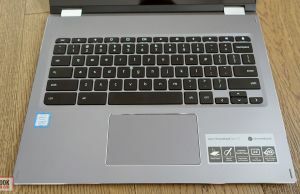 Acer did not went with per-key illumination, but instead with an array of LEDs spread between keys, and as a result light creeps from between some of the keys: F and G, N and M, H and J are the most visible, as the others are covered by the hands when typing. 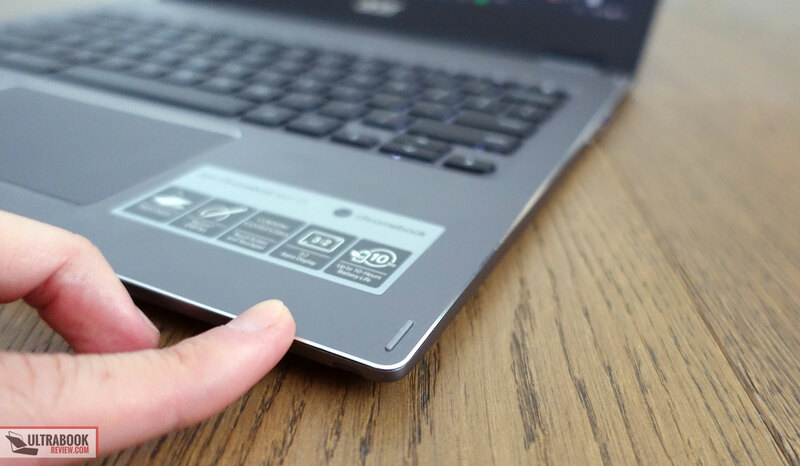 I also noticed that the illumination is always active and doesn’t turn off after a while, like on other laptops, so you’ll have to do that manually when needed. That aside, coming from a Windows laptop, it took me a while to get used to the layout. The standard set of keys are just fine, however there are no Function keys at the top or Home/End/Del etc., and no Windows key either, so my mind had to remap all the shortcuts I was familiar with from Windows. It takes a while, and a handful of Google searches, but I got used to most of them during my time with this Chromebook. It would surely take me longer than two weeks to accept Alt+Backspace for Delete though. 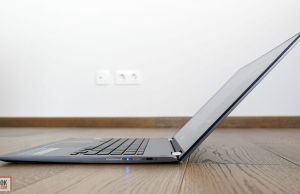 A clickpad is placed beneath the keyboard, fairly spacious and precise with everyday use. It’s a smooth glass surface, clearly indented from the palm-rest around, and responds quickly and accurately to swipes, taps and gestures. However, gentle two finger taps aren’t always recognized, and the physical clicks are also a little clunky and stiff, so I struggled with right-clicks on this particular test unit. 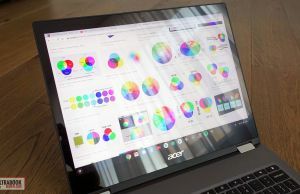 For the screen Acer went with a 13.5-inch high-resolution IPS panel with 3:2 aspect ratio and touch, similar to what you get with other premium ChromeBooks like the Samsung Pro and Pixelbook. 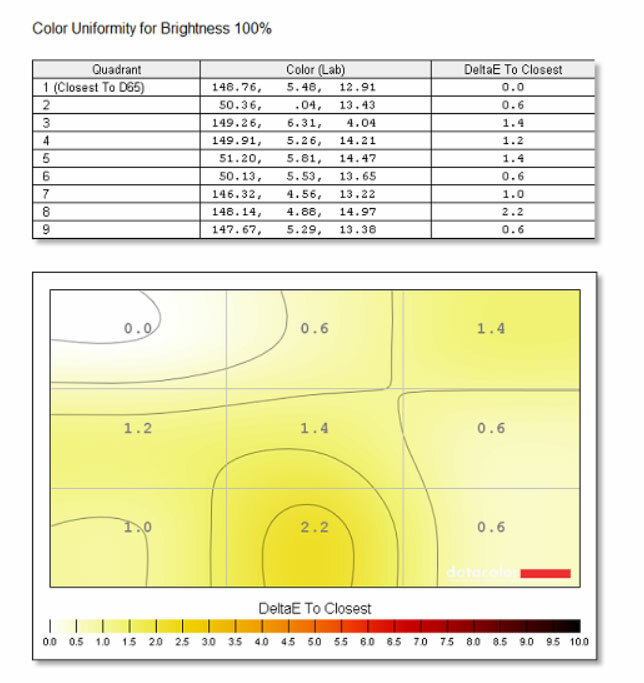 It’s a good quality panel, bright enough for daily use even in bright environments, with good contrast and fairly rich colors. It’s also sharp, and you’ll have to adjust the font-size and appearance in order to make things large-enough for comfortable daily use. 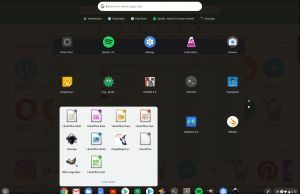 I couldn’t find any information on the panel’s hardwareID with the Android and Linux apps I’ve tried, thus you should look for other reviews that might shed more technicalities on this topic. 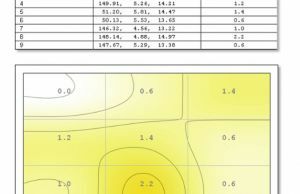 I can however share some details on the brightness, contrast and uniformity details captured with my Sypder 4 sensor. 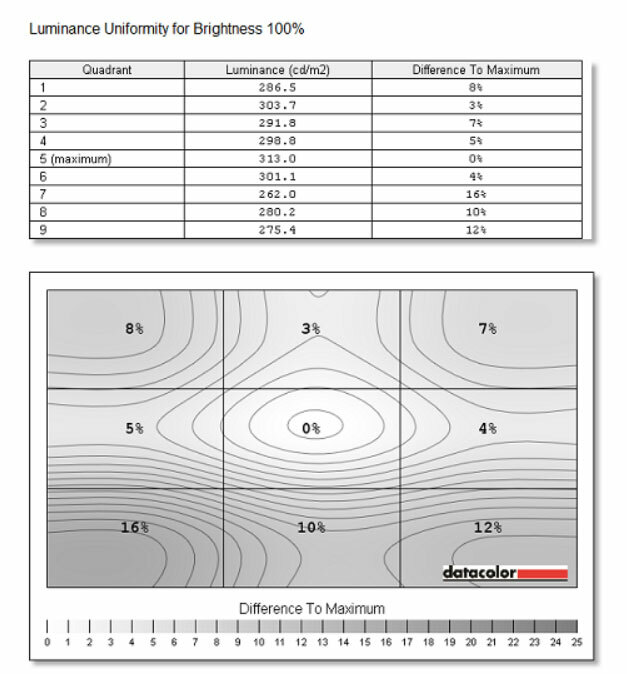 Black on max brightness: 0.27 cd/m2. 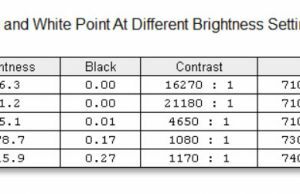 Keep in mind my sensor measures brightness and contrast by quickly switching between a white and black image, so the real maximum brightness is a little higher, at around 350 nits. 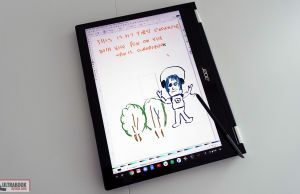 It’s also important to mention that this screen integrates a digitizer with Wacom EMR pen support, and a pen is included with the final retail units of the Chromebook Spin 13. 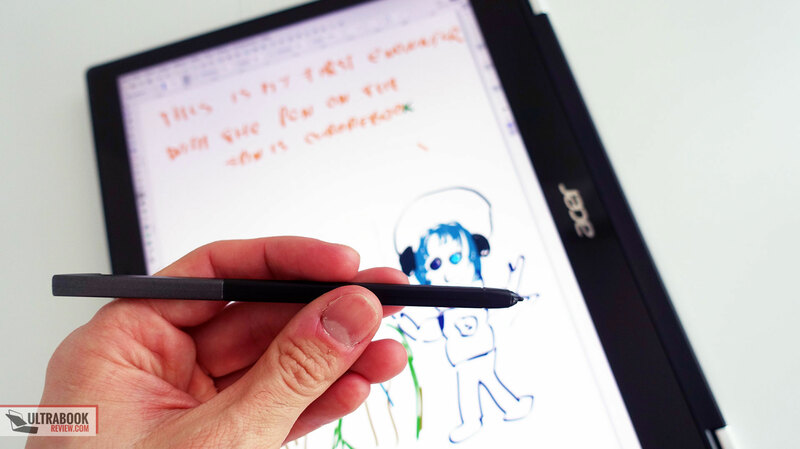 It’s tucked away inside the laptop and it’s much as you’d expect from a modern passive pen: compact, light, grippy, easy to use and responsive. 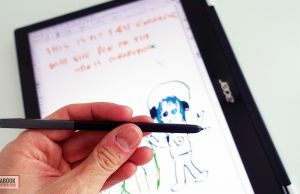 My experience with passive pens is fairly limited, but I found this one comfortable to grab and use, much like a regular pen, as well as accurate for drawing, sketching and taking quick notes. My only nit is with the palm rejection, as Inkscape still records some unwanted arm swipes when resting the hand over the screen. 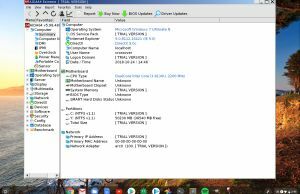 As I mentioned in the beginning, we got to test the Core i3 variant of the Chromebook Spin 13, with 8 GB of RAM and 64 GB of eMMC storage. 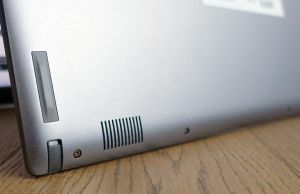 These would be entry-level specs for a Windows laptop, but don’t forget the Spin 13 is a Chromebook, and actually one of the most powerful options out there, as most others are based on Core Y or lower-end hardware. Yes, the storage is a little slow and the storage space fairly limited if you plan to store offline content, but otherwise this computer is lightning fast. 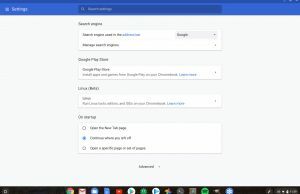 I haven’t noticed any sluggishness or stuttering with everyday browsing, not even with 30-40 tabs open at the same time, Youtube running in the background and multitasking between different apps and sites. Such loads would have brought a similarly specked Windows laptop to its knees, but not this Chromebook. If you’re interested in benchmark scores, I’ve added some below, as well as a reference to the Core Y i5 powered Pixelbook (based on these results), in order to see how much faster the Spin 13 is. 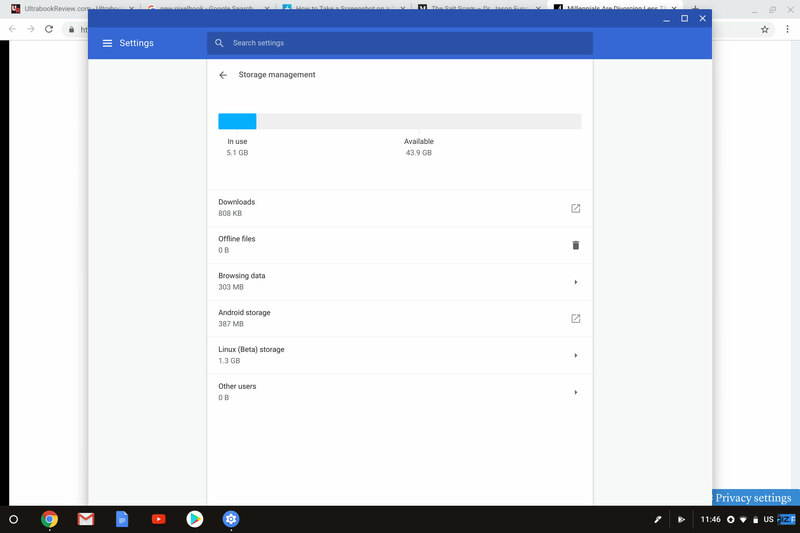 The Pixelbook still wins at the storage department, with support for faster PCIe SSDs (on the Core i7 variants), but the Spin 13 Chromebook can handle multitasking and demanding loads a little smoother due to the more powerful CPUs inside. 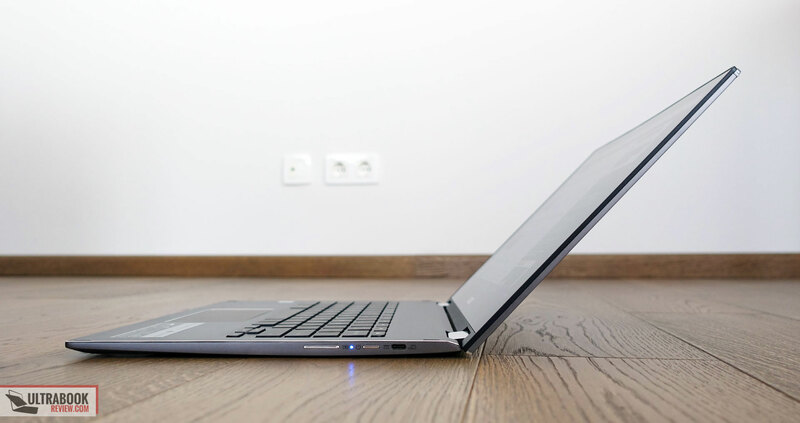 The i5 Core Y comes close of the i3 Core U, but the Spin 13 also gets a significantly faster quad-core i5 with up to 16 GB of RAM on the higher tier configurations. 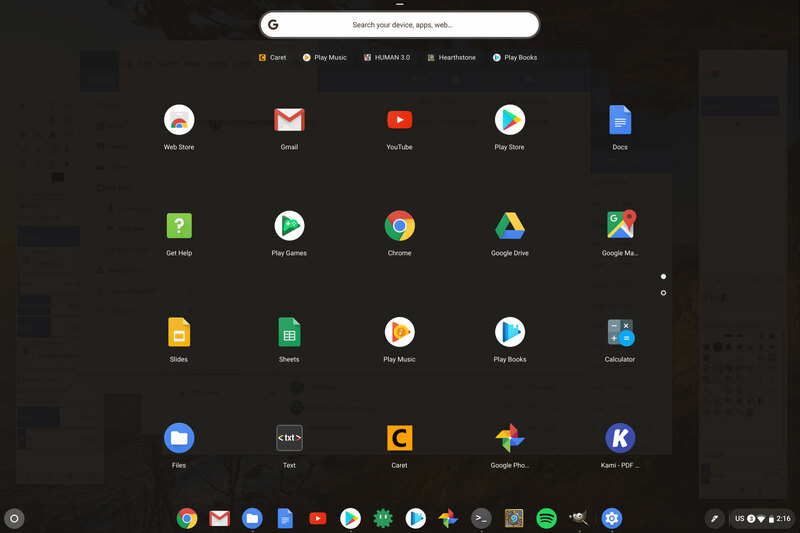 This would be overkill for everyday use, but it could prove useful if you plan to run Android and especially more demanding Linux apps on your computer. 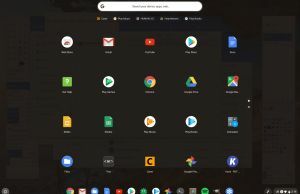 As far as the software goes, ChromeOS is based around the Google Chrome browser and can do pretty much everything you can do with Chrome on a Windows laptop or Mac. On top of that, ChromeBooks have been able to run Android apps from the Play Store for a while now, there’s no real news here. Our Spin 13 handled fine all the apps we tried, including some games like Heartstone, Kingdom Rush or Asphalt 9. 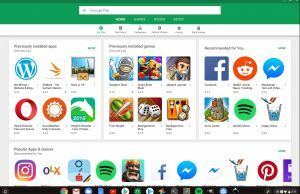 However, not all Android apps scale fine on the 3:2 high-resolution screen or even work in fullscreen, thus the experience is still lacking here and there. 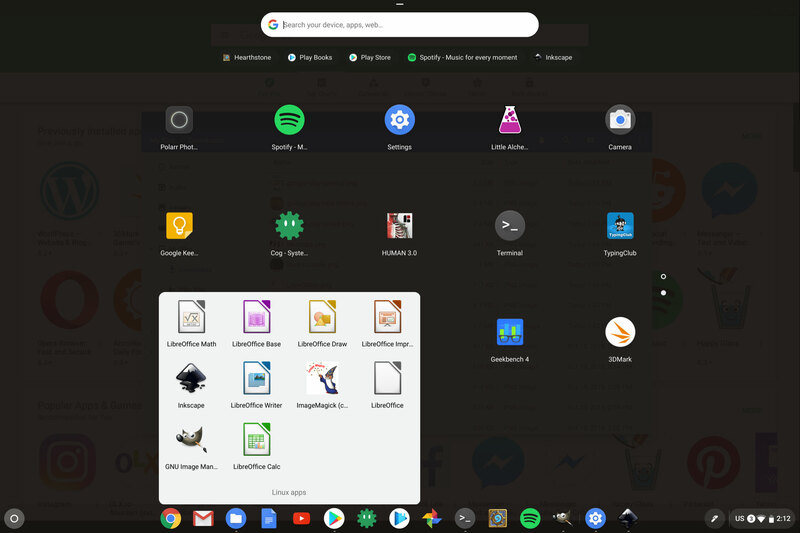 On top of that, you should properly organize the Android apps you’ll want on your computer, otherwise you’ll end up with confusing duplicates. 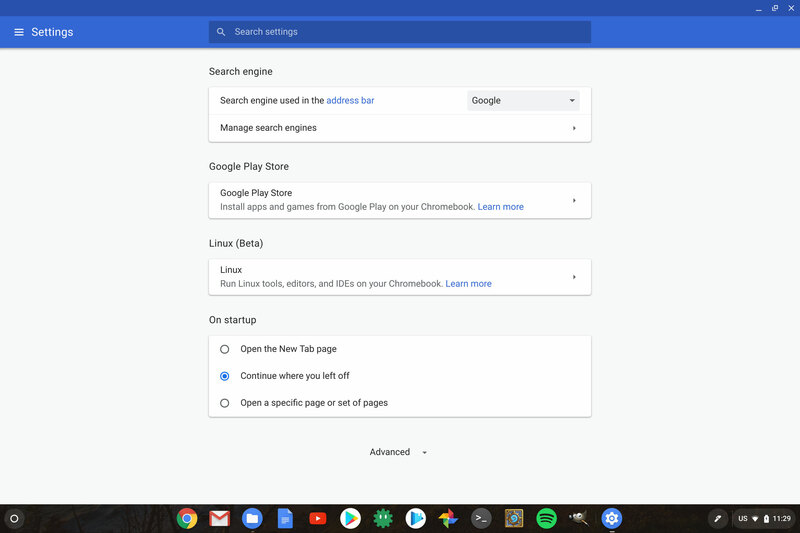 For instance, Maps, Spotify or Gmail run as browser tabs by default on ChromeOS, but you can also find dedicated apps in the Play Store. 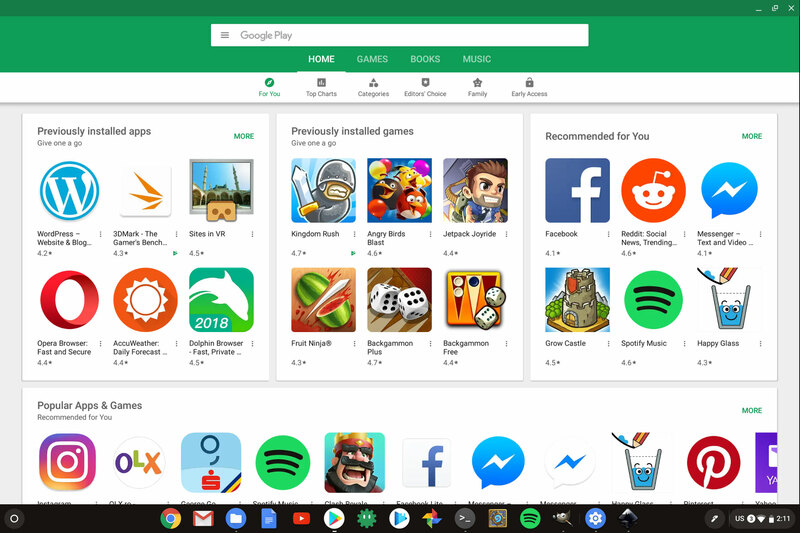 I’d recommend sticking with the standard tabs when possible and only install Play Store apps when there’s no other alternative. 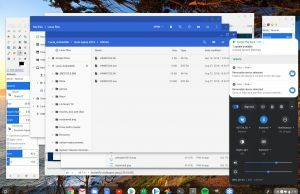 The novelty with the Spin 13 is improved Linux app support, which is coming to other Chromebooks in the near future. 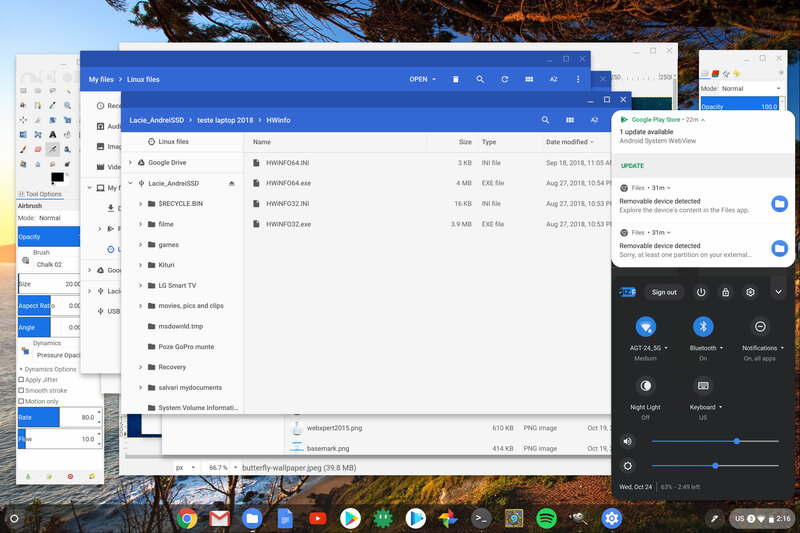 We ran the official ChromeOS 71 build on the Dev channel on our unit, and Linux support is still in Beta, but functional to some extent. 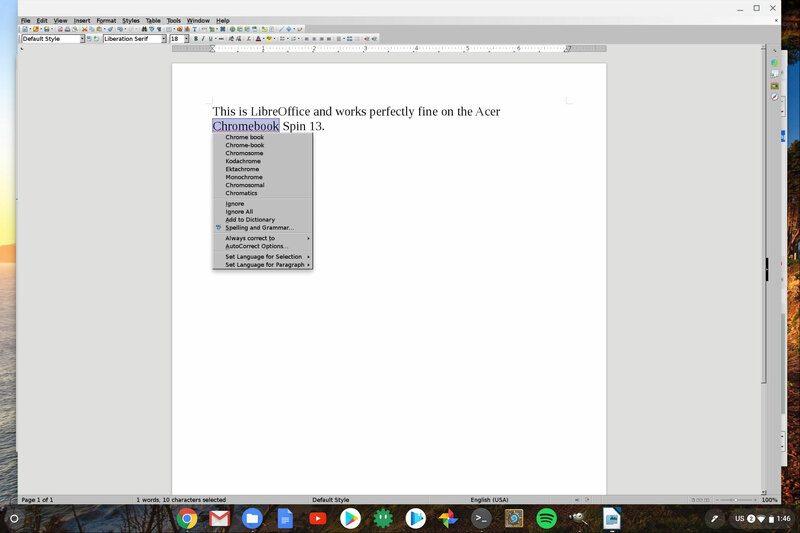 My experience with Linux is very limited, but I was able to easily install apps like LibreOffice, Gimp or Inkscape with just basic Console commands. You have to install these from the Console, but you’ll be able to access them from the app drawer afterwards. 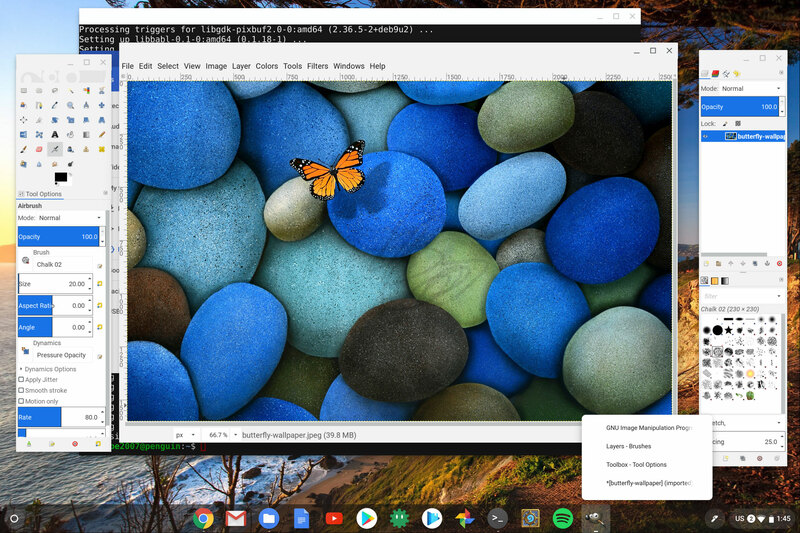 The Linux experience on ChromeOS is based on a Crostini container, which is pretty much “Linux for beginners” and feels like running Linux inside ChromeOS. 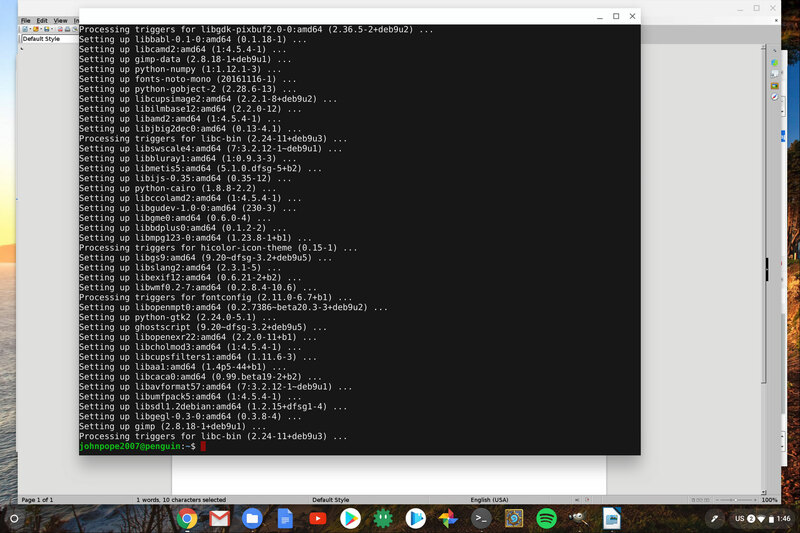 Project Crostini is still in its infancy though, lacks certain features like GPU acceleration, audio, USB support and others, and is only supported by a handful of ChromeBooks. This should change in the months to come though, keep an eye on this Reddit topic for updates. 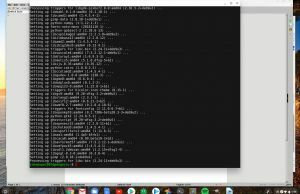 With Linux properly implemented, you could also run Windows apps on a Chromebook with Wine. 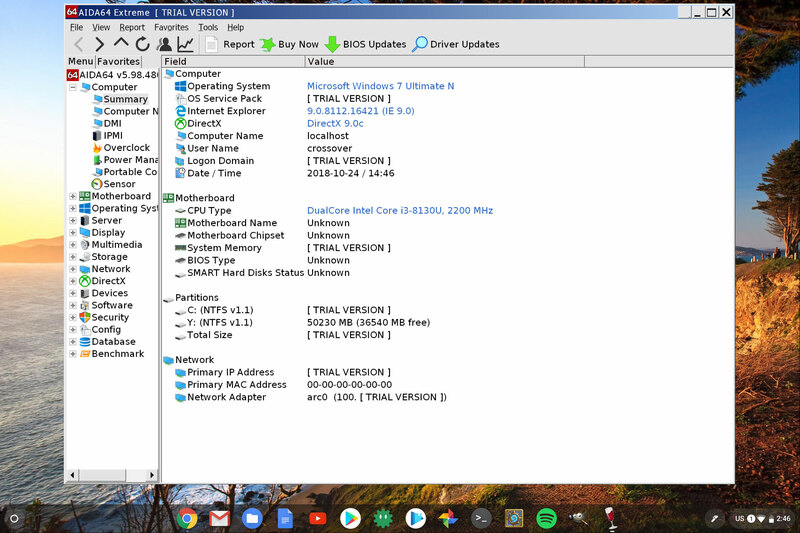 I wasn’t able to install Wine on this sample, but I could run some basic Windows apps with Crossover, which is an Android app that can emulate Windows applications on Intel based devices. 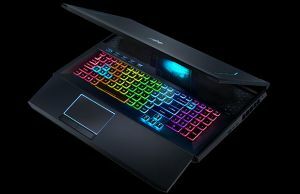 This allows to install Steam and some older games, among others, but I didn’t get to properly give it a try on this laptop. 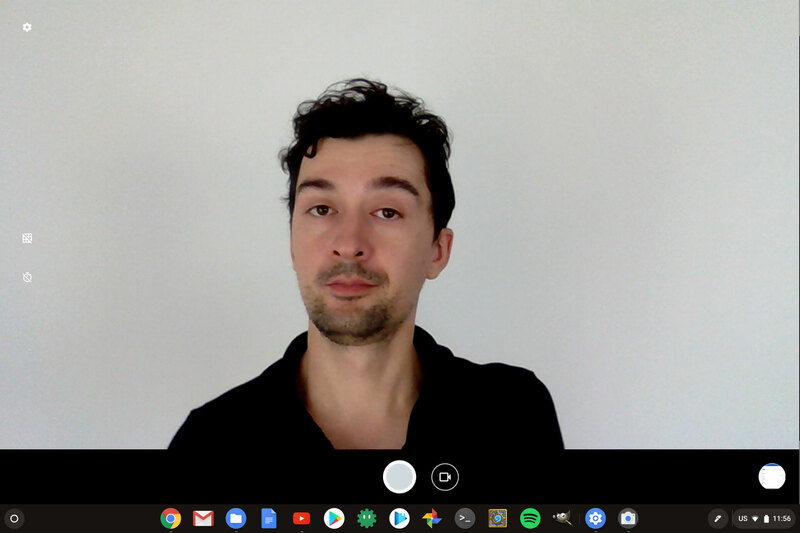 All in all, ChromeOS has come a long way since our last encounter. 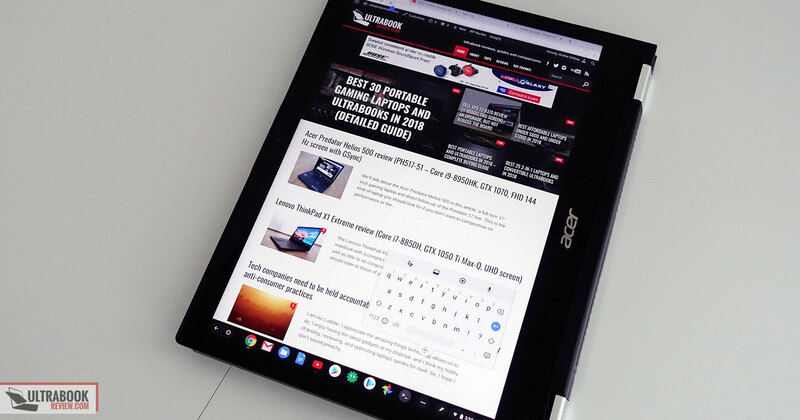 It’s fast, secure and stable for the everyday user, as well as nicer polished on these newer iterations, especially in tablet mode, even if the Spin 13 is not necessarily the most ergonomic ChromeBook in tablet mode. 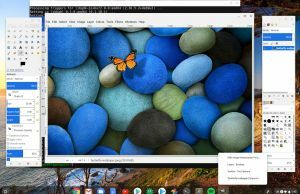 It is however one of the better specked options out there, and paired with improved Linux support in the near-future, it can become a more versatile and more capable computer than any of the Chromebooks of the past years. 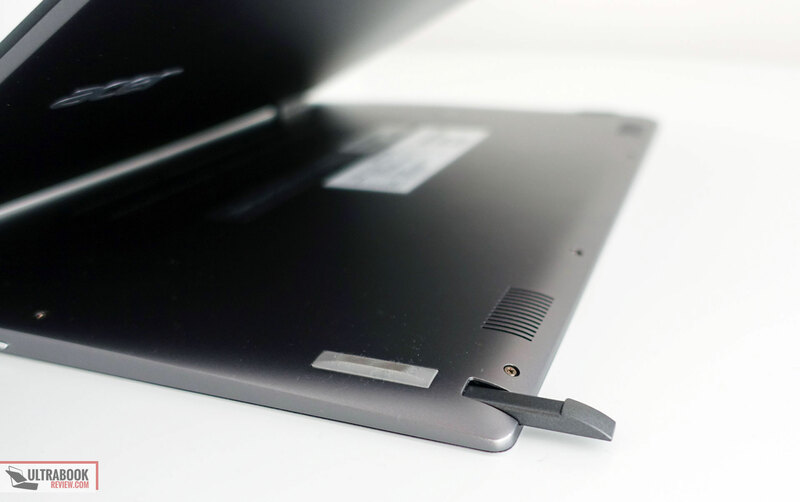 There’s a fan inside the Chromebook Spin 13, required to keep the Core U processor at bay in demanding loads. 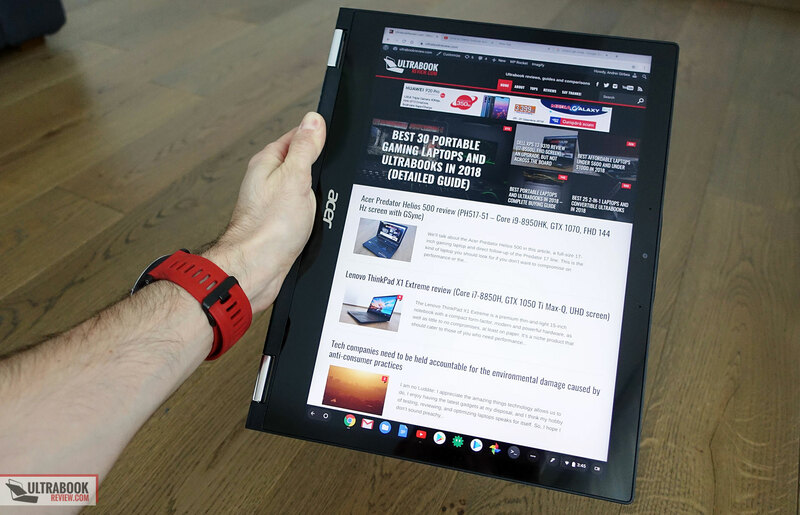 That also translates in air grills on the belly and on the back edge, which take a toll on the design and even functionality in certain cases (more difficult to hold in tablet mode, air intakes shouldn’t be covered, etc). 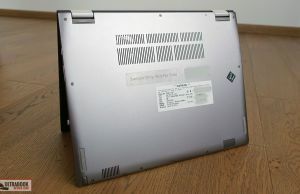 However, the fan remains completely quiet with everyday use on our i3 configuration, and only kicks in when the device is plugged in or runs more demanding loads, like a game, thus the active cooling has no negative impact on the daily experience, except for those aforementioned design inconveniences. The fan keeps fairly quiet with games, spiking to about 35-36 dB at head level, and it remains active for a while after turning off the demanding loads, but at completely inaudible noise levels. The Spin 13 runs cool with everyday multitasking and demanding chores, its metallic surfaces averaging temperatures in the low 30s with daily use and high 30s with more taxing activities. 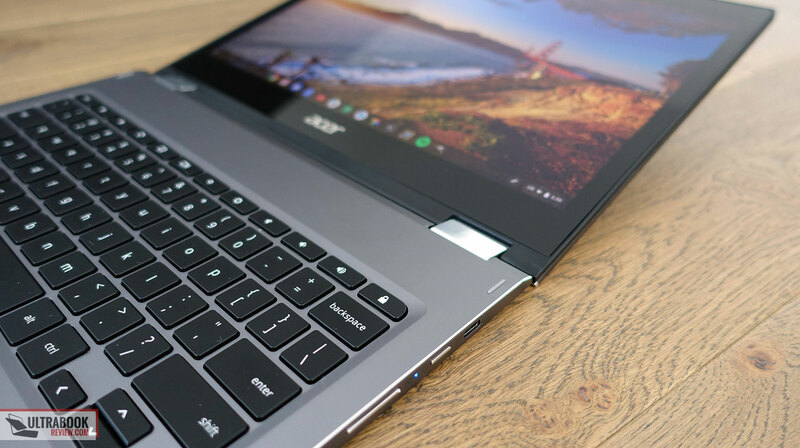 There’s Wireless AC and Bluetooth 4.2 on this Chromebook, and the integrated wireless solution is fast and reliable, both near the router and at longer distances, at 30+ feet with obstacles in between. The speakers on this thing are surprisingly good. 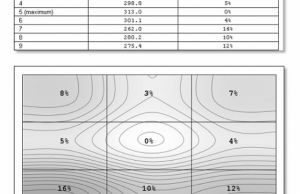 They peak at about 80 dB at head-level and the sound coming out is clean, with no distortions at high volumes, as well as pretty rich for this class, with fair mids and highs, but also some decent lows, noticeable from around 75 Hz. Just keep in mind that due to their placement on the bottom they are fairly easily to cover and muffle while using the computer on the lap. 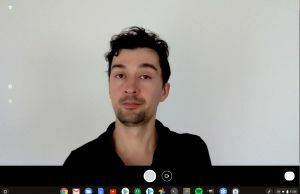 There’s also a camera at the top of the screen, and like with most laptops available these days, it’s alright for occasional calls, but still rather mediocre in terms of image quality,e specially in dimmer places. 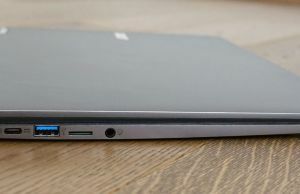 The Spin 13 Chromebook gets a 54 Wh 4670 mAh battery, larger than on most Chromebooks and a partial justification for the increased weight. 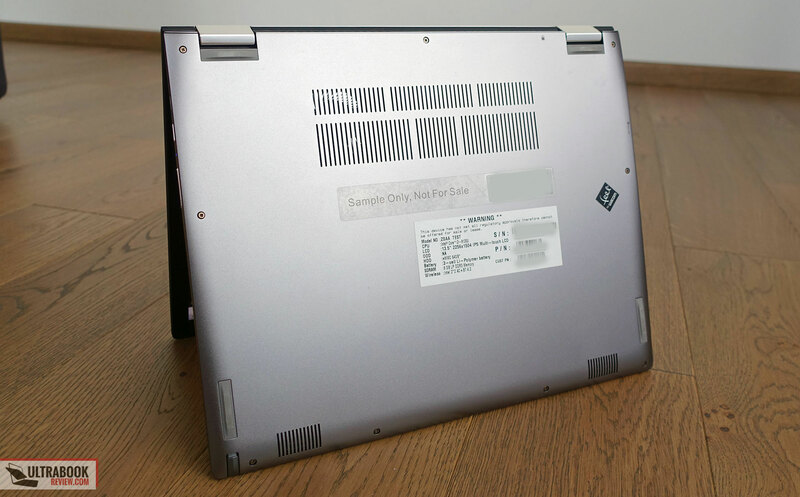 We weren’t able to run HWinfo on this laptop and cannot offer you our standard battery discharge logs. However, we got around 7-8 hours of daily use and browsing, as well as around 10 hours of Netflix streaming on our test unit, with the screen set at 40% brightness, roughly 120-140 nits. 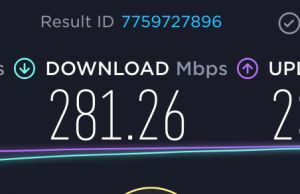 That’s not bad at all, but at the same time shorter than you can get from alternatives with lower-power hardware, despite their smaller batteries, which comes to nos surprise. 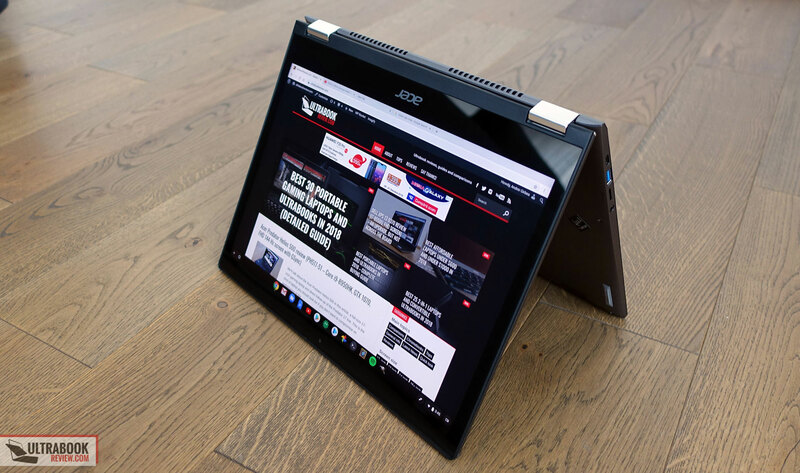 Acer pairs the Spin 13 Chromebook with a standard, fairly compact and light, 45 Wh charger, and a full-recharge takes a little over 2 hours. The Chromebook Spin 13 is available in stores around the world as of late October 2018, in a bunch of configurations. 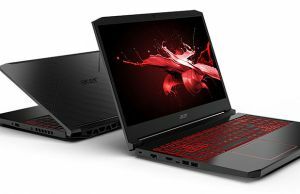 The base version includes a Core i3-8130U processor, 4 GB of RAM and 32 GB eMMC storage for around $700, while upgrading to 8 GB of RAM/ 64 GB of storage will cost around $50, jumping to the i5 CPU an extra $100 and jumping to 16 GB of RAM and 128 GB of storage $50-$100 on top of those. In other words, around $900 will get you the i5-8250U configuration with 8 GB of RAM and 128 GB of storage, and roughly $950 the 16 GB/128 GB variant. These are MSRP prices at launch, and they’ll definitely drop over time. Follow this link for updated prices and configurations at the time you’re reading the article. 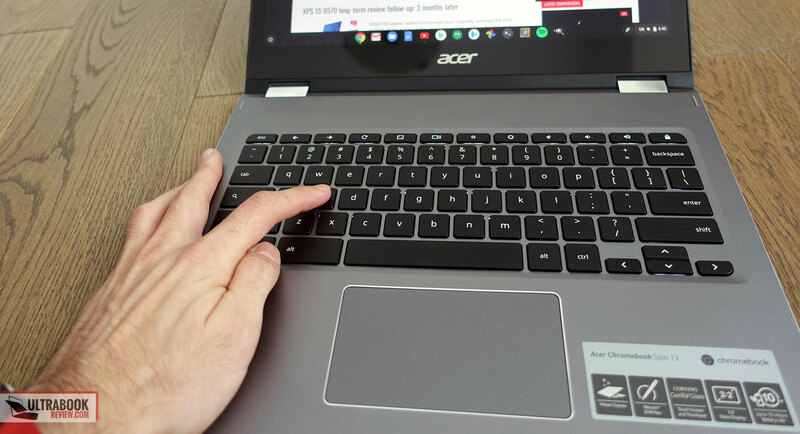 I’ve read some overly hyped articles claiming the Spin 13 is the best Chromebook ever made, but while my experience with this product has been positive, I still don’t think this is the smartest choice for everyone, and here’s why. 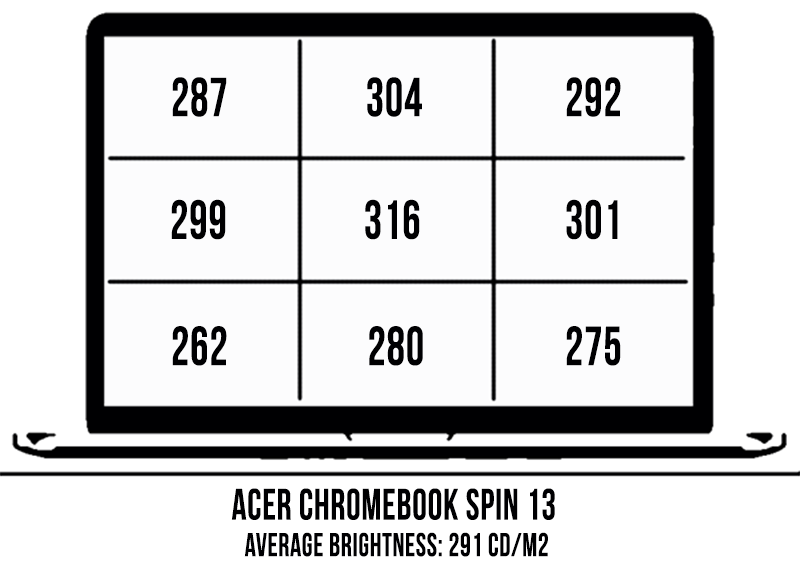 Yes, the Chromebook Spin 13 checks most, if not all the right boxes. 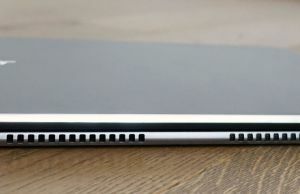 It’s well built, it looks nice, it gets a good screen with an included EMR pen, punchy speakers and a fast keyboard. 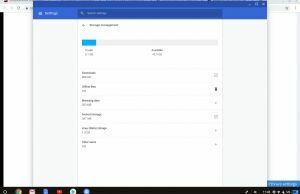 It’s also more powerful than most other Chromebooks on the market and still lasts for a fair while on each charge despite that, thanks to the big battery inside. 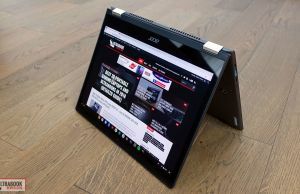 On top of these, the 3:2 screen helps productivity with its increased real-estate and the everyday experience is smoother than on even the most powerful Windows laptops out there, from the quick response when switching between apps and tabs, to how quickly this resumes out of sleep and the excellent efficiency. 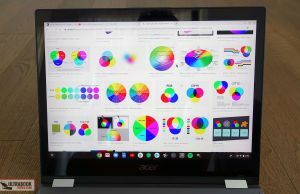 However… the Spin 13 Chromebook is also large, heavy and expensive for what it is, thus I feel that the average user would find better value in either one of the more affordable mid-range Chromebooks of the moment, like the Asus Chromebook Flip C302, or even the nicer polished and more compact Pixelbook, which these days starts at around $800 in the US (for the i5/8 GB/128 GB version). 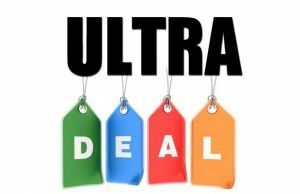 And we’re not even going to mention the multitude of more capable Windows notebooks available for under $1000 these days. 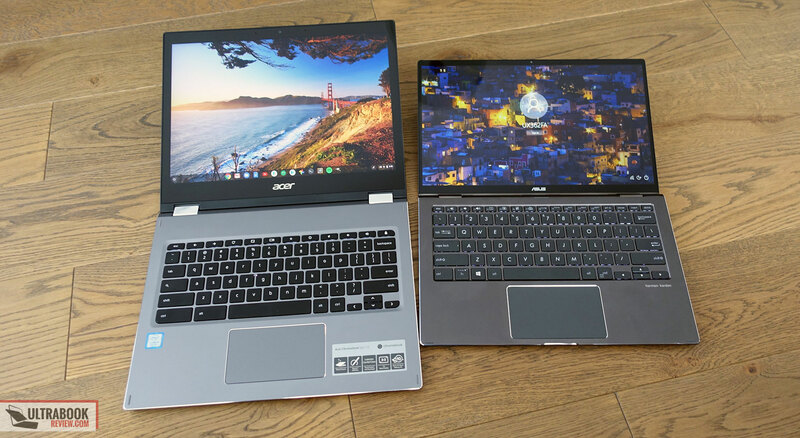 The Spin 13 ChromeBook could be the right pick for power-users, those of you who plan to put its powerful hardware to good work, but improvements in Linux support are required imo to improve its versatility. 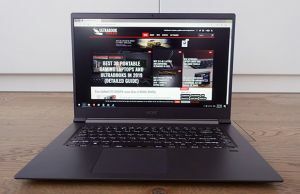 With VSCode and Wine working smoothly at some point in the future, this laptop could be more than just a Chromebook with fast specs, a snappy computer for the geekier among you. 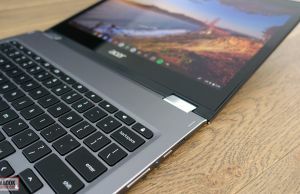 As it is at the time of this article though, I feel that it’s stuck somewhere in no-mans-land: too expensive for the average user, and not yet capable-enough for power-users, despite packing hardware and characteristics like few other Chromebooks.